This article is incomplete. It does not continue on page 188. In fact I looked on every page of the magazine, and the ending is nowhere to be found. Oh well. Based on an interview with Dr. W. R. Whitney and Associates of the General Electric Research Laboratories Scientists have accomplished the marvelous feat of literally taking nothing, sealing it in a glass tube and making it perform the tasks hitherto done by huge motors. Thyratrons, as these amazing vacuum tubes are called, may soon relegate all machinery to the junk pile. 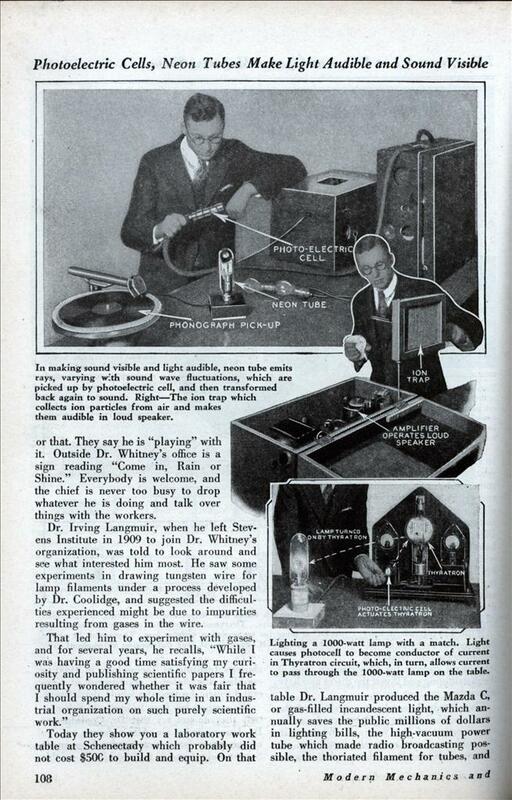 Already vacuum tubes are curing dread diseases, increasing the range of man’s senses, and saving industry huge sums. IMAGINE a tube, a thing of glass and metal, replacing a motor to operate a piece of machinery. Imagine a fiat bed printing press—or any machine using a reciprocating motion-—getting its energy from a glorified descendant of a radio tube. That’s just one of the things that research engineers of the General Electric Company expect to see within the next few years. With Thyratron power tubes and solenoids it is technically possible today. William C. White, engineer of the vacuum tube research department of General Electric, makes that prediction. The field of vacuum tube engineering, he says, is not to simply do a thing in a different way and with different means, but to do it better and cheaper. It is possible, he adds, that as knowledge of the possibilities of vacuum tubes increases we may have to modify many of our ideas, such as the accepted one that an electric motor is the best and cheapest means of producing mechanical movement, at least in reciprocating parts. A few steps from his office is a little framed sign beside a door. It reads: “Open locks, whoever knocks”—a quotation from Shakespeare. Beneath is a small bronze plaque with the monogram of “G. E.” A guide taps twice on the plaque, pauses, taps seven times more. The door silently swings open. As the visitor steps over the threshold a talking machine whirs into motion and calls a greeting. All around the room are ranged exhibits of electrical apparatus. As you pause in front of each it automatically starts, and stops as you walk away. A pair of Thyratron tubes are the switches that intercept the code signals tapped on the plaque and start the door-opening mechanism. Light beams falling on photoelectric cells are interrupted as you stop in front of an exhibit, and the interrupted current releases the energy of more Thyratrons to start the machinery working. The suffix “tron” applied to a long line of tubes from the first high voltage radio valve, means an object that is used as an instrument or tool. And the prefix “thyra” comes from another Greek word meaning door, or gateway. And that’s just what a Thyratron is, for it will convert direct current into alternating, or invert alternating current into direct As a valve it can replace switches, current breakers or lightning arresters. It can change current of one frequency into another, or pick out any particular portion of an electrical wave and put it to work. It can control any form of electrical apparatus, operate burglar alarms and do other forms of work. And it may even, as Mr. White predicts, displace electrical motors. The Thyratron is really a mercury vapor arc switch controlled by changing the grid current in the tube. Its ability to convert direct current into alternating and invert alternating current into direct opens up a vast field of incalculable value. It may make possible the transmission of superpower over long distances an economical possibility, and so help solve the problem of getting hydro-electric energy from distant water power sites to cities where it is needed, or the burning of coal at the mines and transmission of its energy as electrical power. Long distance transmission has not been practical because it is cheaper and easier to generate alternating current, but the losses in the transmission of alternating energy are prohibitive over distances of more than a couple of hundred miles. Direct current, on the other hand, can be transmitted with only nominal losses, but costs more for generating equipment, and is less adaptable for economical distribution and use in the city. With Thyratrons it may be possible to generate alternating current, convert it into direct current for transmission, and at the distributing end invert the direct and have alternating current again. Five hundred people are working at the research laboratories at Schenectady under the direction of Dr. Willis R. Whitney, in the oldest great research institution in America. When Dr. Whitney left Massachusetts Institute of Technology in 1900 to establish the research department of General Electric he was the whole department. His method has been unique. At Schenectady they do not say that Dr. Coolidge, or Dr. Langmuir, or Dr. Alexanderson, or any of the other famous men who have made Schenectady famous is “working” on this or that. They say he is “playing” with it. Outside Dr. Whitney’s office is a sign reading “Come in, Rain or Shine.” Everybody is welcome, and the chief is never too busy to drop whatever he is doing and talk over things with the workers. Dr. Irving Langmuir, when he left Stevens Institute in 1909 to join Dr. Whitney’s organization, was told to look around and see what interested him most. He saw some experiments in drawing tungsten wire for lamp filaments under a process developed by Dr. Coolidge, and suggested the difficulties experienced might be due to impurities resulting from gases in the wire. Today they show you a laboratory work table at Schenectady which probably did not cost $50C to build and equip. On that table Dr. Langmuir produced the Mazda C, or gas-filled incandescent light, which annually saves the public millions of dollars in lighting bills, the high-vacuum power tube which made radio broadcasting possible, the thoriated filament for tubes, and atomic-hydrogen welding, among other things. The way in which research in pure science produces useful by-products for industry has been demonstrated many times at Schenectady. One of the most recent is the development of an artificial fever producer for hospital use. Fever, as doctors have come to know, is not necessarily a symptom of disease, but nature’s method of combatting it. By producing fever it is possible to cure some diseases. In at least one form of insanity cures have been effected with high fevers by letting malaria mosquitoes bite the patient, and then curing the malaria. A few years ago the research engineers were experimenting with short-wave radio, using considerable power of exceptionally short waves. They discovered that the workers in the apparatus room developed symptoms of fever when waves of less than thirty meters were being used. The mike and phonograph setup for soothing the baby reminds me of something you’d see in a Wallace and Grommet movie. I wouldn’t want to be around those pipes of high pressure mercury vapour when they spring a leak. Tracy Blomgren: And who are “they” this time? Yeah this is a spoof. By this time it was common knowledge that AC travels long distances with nominal loss, not DC. Especially GE, the company that pioneered AC. Amusing article tho, if you look at it in the climate of groundbreaking innovations around the turn of the century. I suppose it could even be an oblique dig at mr. tesla. Actually Westinghouse pioneered AC. General Electric was associated with Edison who championed DC. ligu: Good catch! And it also ties in with the whole thyristor article as well! Huh, that’s interesting stuff, I stand corrected. I still can’t quite swallow the stuff about healing rays. And increasing the senses?!? Maybe it’s just sensationalism. 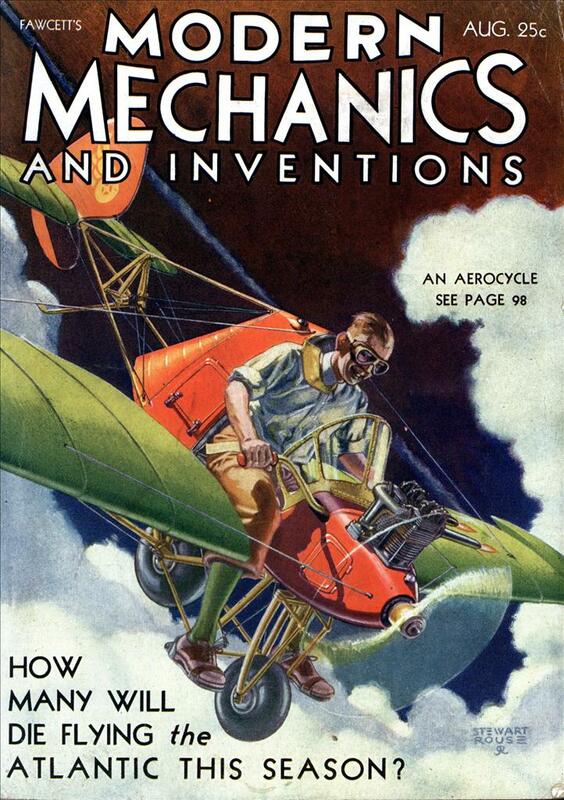 While we still use motors to move things, in at least two ways the article did show the future correctly. Diathermy was illustrated, and, of course, that illustrated the principle later employed in the microwave oven. Also, while they didn’t end up using thyratrons for HVDC power transmission, later solid-state technologies were applied to it. The reason we use AC instead of DC for power is because, with transformers, it’s easy to change the voltage level of AC electricity. With a higher voltage, resistive losses are lowered as a simple consequence of Ohm’s Law. But just as AC can travel through a transformer, or emit radio waves, while resistive losses are lowered by using a high voltage, AC in a power line is still inductively coupled to the environment. So the ideal method of power transmission would be to use very high-voltage DC instead, to minimize both kinds of losses. We now have efficient enough ways to convert between AC and DC to make it practical to convert high-voltage AC to high-voltage DC for certain selected long-distance transmission lines – and then convert it back to AC so that the voltage can be changed to something much lower that is safer to use.